The main reason for this post is to share my surprise and joy at the fact that the night before last (Friday night) I worked T32C with my Tut80 – a QRP rig designed by Dan Tayloe N7VE that has a direct conversion receiver and a CW transmitter that in my particular case, puts out 4 watts (they seem to vary.) It’s not the kind of rig I’d normally think of using to contact a DXpedition, but as I don’t currently own a more conventional rig with dual VFO’s, I wasn’t about to miss out on the T32C fun by not trying at all. What made the contact with T32C even more surprising to me was not only that I was only putting out 4 watts, but that I was putting it out into an inverted vee dipoole cut for 40M with the apex at 47 feet, and fed with coax! If I were using QRO, I don’t think I’d attempt to tune up such an antenna on 80M and certainly wouldn’t expect it to perform all that well. However, with only 4 watts output, I didn’t think much ill harm could come from excessive feedline radiation and so I tweaked the knobs on the ATU and hoped for the best. Let me start from the beginning though. On seeing all the fun many people have been having working T32C, I wanted to at least work them on one band. The only rigs I currently own are the Norcal 2N2/40, the Tut80, and the beta version of the NT7S-designed CC-20. They are all QRP monoband rigs, none of them have dual VFo’s, and so the only way to work split frequency is to use RIT and hope that the split isn’t more than about 1.5 – 2KHz. I tried to snag them a few times on 40 without much success, but that was fairly early on when there was plenty of competition from other US stations. Then last Saturday morning during the Oceania DX Contest, I noticed that T32C had entered the contest and were working simplex on 40. It was 5am, there wasn’t a whole lot of competition, and I got them in the first few tries with 4 watts from the Norcal 2N2/40 to my only HF antenna – an inverted vee cut for 40 up at 47 feet. Bingo! Later that day, I saw myself in their log and that was when lightbulbs started coming on and ideas forming. How many bands could I work T32C on with my modest collection of QRP rigs? I wasn’t able to put the CC-20 into service just yet, as I had just fried one (or more) of the active devices during beta-testing and was awaiting parts in the mail from Jason NT7S. That left the Tut80. The idea of working Kiritimati on 80M was very appealing, but I have never had much success on that band due mainly to my inability to erect effective antennas at the various places I have lived. All I had to work T32C was a QRP direct conversion transceiver on 80M and a 40M coax-fed inverted vee. What do you think my chances were? I didn’t think they were very high, but all I had to lose was time, so I had a go. 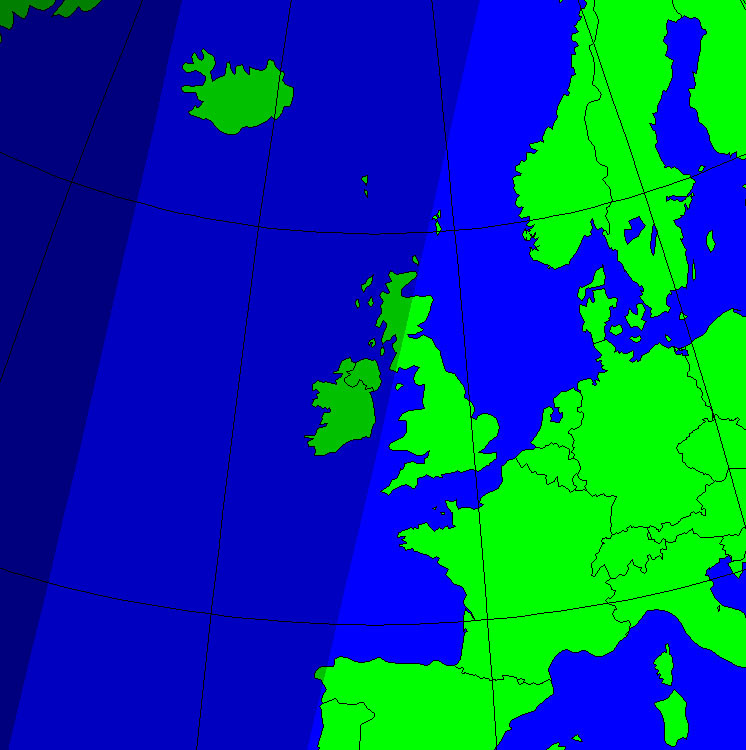 From the above, it looked like my best opportunity on 80 would be from 0600-0800 utc. That morning, the T32C team had posted on their website that in response to requests for more 80M CW activity, they would be QRV on 80M CW for 2 days in a row at European sunrise, then on SSB for 1 day, then CW for 2 days, and so on. 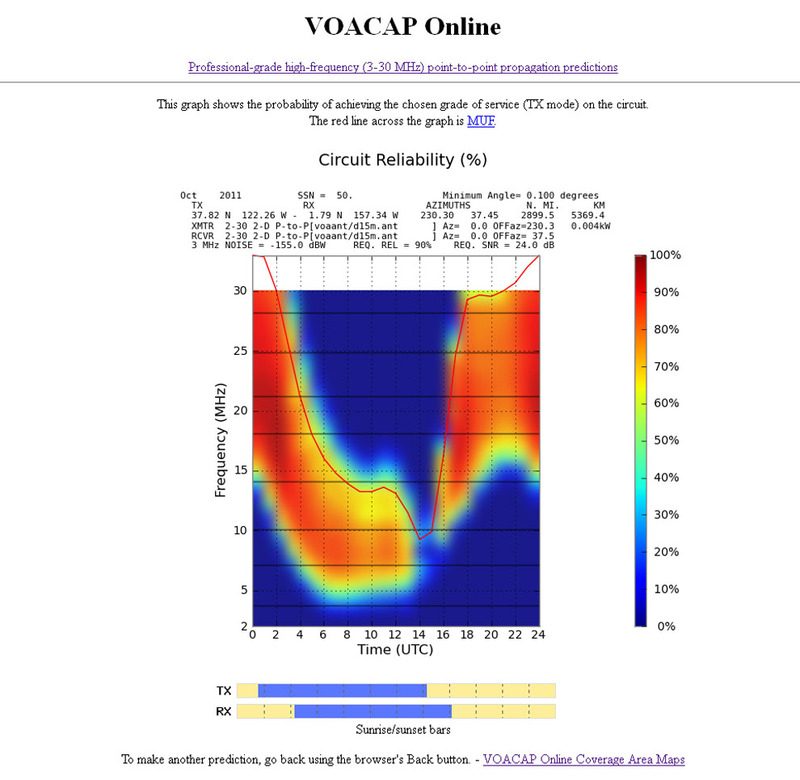 This schedule coincided with my best chance to contact them as predicted by VOACAP – excellent! I haven’t worked that many DXpeditions in the past, but on the few occasions I have, I’ve done it manually with a key or paddle. It wasn’t until I saw AE5X’s video of him working T32C with his K3 that I realized for QSO’s like this, you can enter your overs into the keyer memory, then when it’s your turn to send, all you have to do is push a button. Thanks for that John. Incidentally, John contacted them on CW on all HF bands (including top band) , of which the 40 and 80M QSO’s were QRP. His 40M QSO was with just 2 watts. On reflection, the dit-dit was unnecessary. I got the Tut80 set up and started watching the HRD DX Cluster Site for the appearance of T32C on CW. At some point during the evening (my time) they arrived, and were listening 1KHz up from their frequency of 3516 KHz (very do-able by the Tut80’s RIT – thank goodness it wasn’t a much bigger split). Although other stations on the west coast were hearing them with quite strong sigs, they were fighting with the high noise level for me. I think the main reason for that was my poor antenna for 80M (the 40M inverted vee fed with coax) which was picking up a lot of QRN but not a lot of the wanted signal. The other reason was probably that although the Tut80 is a good receiver as far as fairly simple direct conversion receivers go (stable VFO, no common mode hum or broadcast breakthrough and 700Hz-wide audio filter with nice sounding roll-off), it’s not exactly a contest-grade receiver. I could really have used a good 80M antenna and a single-signal receiver with some nice sharp crystal filtering, but the Tut80 and my compromise antenna was all I had, so it was what I used. My preference is for a 500Hz sidetone, and the 1KHz split worked out very nicely because by tuning the direct conversion receiver in the Tut80 to 3516.5 KHz, I could hear both T32C on 3516 and the stations that was calling on 3517 – both at a 500Hz pitch. Double-signal reception is not usually thought of as offering any particular advantages, but this was one nice “extra”. If I wanted to listen just to T32C, all I had to do was twist the RIT knob and tune to 3515.5 KHz – 500 Hz below the T32C transmission frequency. Neat eh? Although they were only barely copyable to me, I could make out that they were calling EU EU – meaning they wanted calls from European stations only. This made sense, as part of their stated goal was to exploit all openings to Europe. My hope was that by the time the grey-line had moved across Europe I’d still be able to copy them, and they’d open it up to non-EU stations. I opened up a grey-line map at worldtime.com and started watching as sunlight slowly covered more and more of the continent. QSB was taking T32C just above and just below the high noise level at my QTH, so I’m not sure exactly at what point it happened, but somewhere around the time that most of Europe was in daylight and the grey-line was over the UK, I realized that I was no longer hearing EU EU at the end of the CQ calls. Hoorah! I called a few times, heard them work other stations (including a Brazilian station who had mentioned in the cluster that he was about to lose propagation and really wanted to work them). Then on around the 3rd try, I heard my callsign and a 599. Huh? Really? Did I just hear my callsign coming back to me through the noise? I hurriedly hit the second memory button , and realized that the dit-dit I had programmed in straight after the TU was unnecessary, because by the time the dit-dit was over, they’d already started calling again. I appeared in their online log less than 30 minutes later. to a 40m inverted vee fed by 75 feet of coax! I think the coax must have been forming a pretty substantial part of the antenna as well as the dipole elements attached to it. It was all due to what is probably a low-noise location on Kiritimati, good antennas and world-class operators. My hat is off to the ops at T32C. They are doing a fine job. Next on the agenda is to work them with the CC-20. They haven’t been on 20M CW in the last couple of days. I’m guessing it’s because the higher bands have been hopping. Hopefully for me, there will be a day or two with reduced propagation propagation on 17-10 so that the FB ops on Kiritimati will come down to 20M CW, and I can see whether the XIT that Jason NT7S just implemented in firmware is doing it’s job 🙂 20 could be a tough one though. I suspect there will be a lot of strong signals to compete with. 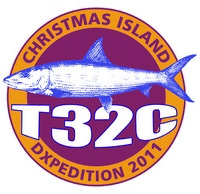 It speaks to the dedication and experience of the T32C team that despite the fact the container carrying their equipment never made it to the island, they continued with the DXpedition and still managed to conduct a very well-run operation, albeit with 9 simultaneously operating stations instead of the originally-planned 15. These excellent operators, a very informative web-site, regularly-updated online log, and the fabulous HF conditions, have all combined to bring the excitement of working a DXpedition to hams like myself who, in the words of the Pet Shop Boys “Wouldn’t Normally Do This Kind Of Thing”. I know I’ll be following DXpedition news more carefully in the future and when I get the K2 that just won’t get itself out of my head, will lose the coax and feed my 40M dipole with balanced line. I’m rather glad that I don’t currently have a more conventional HF multi-band rig. If I did, I wouldn’t have pressed the Tut80 into service, and I wouldn’t have experienced the satisfaction that comes from being able to say “I worked the T32C DXpedition with the Tut80”! Posted in Amateur Radio, Ham Radio, QRP.Tagged Fort Tuthill 80, grey-line map, T32C, Tut 80, Tut80, VOACAP. Congrats! I knew you would get them and they’re still there for another 10 days! Thanks Larry. I only need them on one more band to have made it with all my monoband rigs (the only rigs I currently have, though I aspire to be a K2 owner, like yourself). Abso-frickin-lutely amazing Dave! I’m happier at reading your account of working them than I was at working them myself! You ought to forward this link to the DXpedition’s point of contact…I’m sure they’d be interested to know the conditions under which you worked them. Ditto for Dan Tayloe. Yours is now one of the sea stories I’ll share with folks when the topic turns to amazing DX accomplishments. I hope you get them on 20m. Thanks John. I’m actually glad that I don’t own anything else for HF other than my 3 little monoband rigs. If I’d had a more fully-appointed rig on 80M, I would have used it and not experienced the thrill of doing it with the Tut80. That said, I am heading for a more fully-featured rig in the near future. Your blog is inspiring and instructive to read – particularly the accounts of all the DX you work. Thank you for flying the flag for the QRP community! Dave – Congrats! An even more auspicious achievement when you consider that most of your 4 watts went to warming the inside of your coax… I’d guess that less than one watt was making it to the antenna! A real QRPp DXer ! W3EF, Maury a T32C member pointed me to your blog. To make a long story short, I (ON7RU) turned out to be the operater of the 80m station at that moment. It’s a real pleasure to read these kind of stories and it shows we indeed had good ears, as we had hoped. 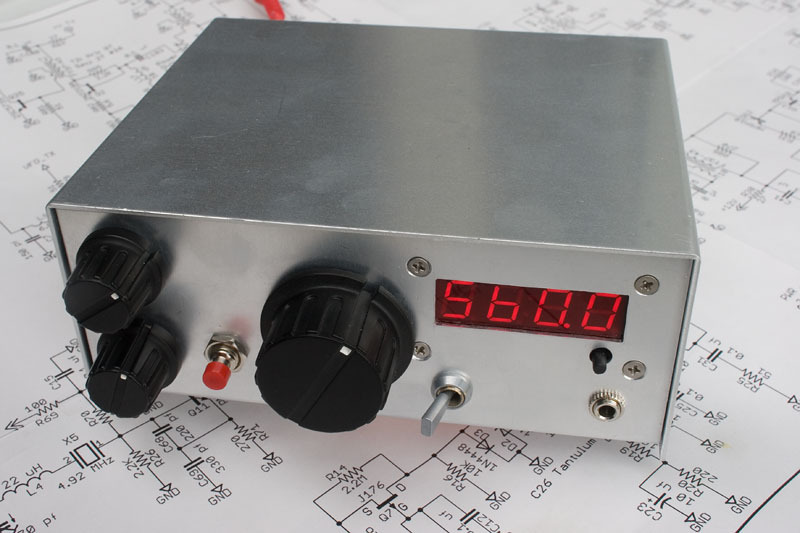 Thanks for your patience and congrats with your DIY QRP stations. Keep up the good work, will follow your blog in the future. Thanks again for the kind words and the flowers, but believe me the pleasure was ours. 73s from Honolulu, leave for EU tomorrow @ 4am. Believe me, that will be a bigger challenge then copying weak signals from the Pacific. Frank – what a pleasure to hear from you. I was very surprised to hear you sending my callsign. Running 4 watts into a coax-fed 40 meter inverted vee, I was not expecting to hear anything back from you at all. You certainly did have good ears out there on Christmas Island. You and the whole of the T32C team have brought a great deal of magic to the amateur radio world over the last month – thank you very much! Have a safe trip back to Europe. PS – I’ve got you on my blogroll. Congratulations with your QRP success! The T32C gang was a bunch of amazing operators with the technical know-how for good reception no less than transmitting. They picked up my mobile sigs on every single band from 160 m to 10 m, in some cases on the very first call. I was running a 100 W TX on CW into a 4.7 m long whip. My radiated power was 2.5 W on 160 m and 8 W on 80 m, from the Aurora Zone where absorption in dB is approximately inversely proportional to frequency squared! The distance is almost 12 thousand km. That is quite an achievement Ted. As you say, your erp was a good deal less than the 100W that was coming out of the TX – and the absorption from being in the aurora zone on top of that. To be fair, QSO’s with T32C weren’t too hard for me because I am only about 13 miles (21 km) from the Pacific Ocean, so once my sigs got to the ocean, it was a clear run over 5800 km of salt water to T32C. you are an inspiration to beginners like me. Keep up the good work!